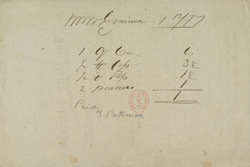 On this side of the advert is a bill addressed to Mr Evanion, who notes that Mr Pateman has been paid. This may be the bill for delivery of the paper. First published as the 'Daily Telegraph and Courier' in 1855, this influential newspaper was originally marketed as a cheaper alternative to 'The Daily News' and the 'Morning Post'. They cost five pence a day, compared to the Telegraph's one penny cover price. Its slogan was: "The largest, best and cheapest newspaper in the world." Broadly conservative in outlook, it focussed on sensational crime stories. This trend reached its apogee in 1881, when a Telegraph reporter "solved" the murder of William Gold, a wealthy businessman who had been done away on the London to Brighton train. The Telegraph obtained a picture of the killer, Percy Lefroy, and published the first portrait picture in any newspaper. As a result, Lefroy was apprehended, and eventually executed for his crime.